I've been making Rainbow Jello almost every year for Thanksgiving and Christmas since High School! It's super fun to either peel apart the layers and eat them one by one, or have a flavor burst when you eat them all at once! I’m not sure exactly where I first learned how to make this rainbow jello recipe, but I’ve been making it for a long time (since I was in high school). It’s such a great recipe for the holidays because it’s easy to make, gorgeous to look at, and also fun to eat! This would be the perfect dessert to bring to a St. Patricks Day feast (lucky rainbow), or you could make it for Thanksgiving or Christmas. No matter where you take it, it’s sure to get some compliments and people will definitely ask you how you made it. To make rainbow jello, you really don’t need much. 6 small boxes of jello for each color of the rainbow, some yogurt (vanilla or plain) and some water is all you need! Before you can start making a beautiful rainbow jello creation, you’ll need a 9×13 baking dish. This thing will be filled to the brim with jello-e goodness by the end of this! 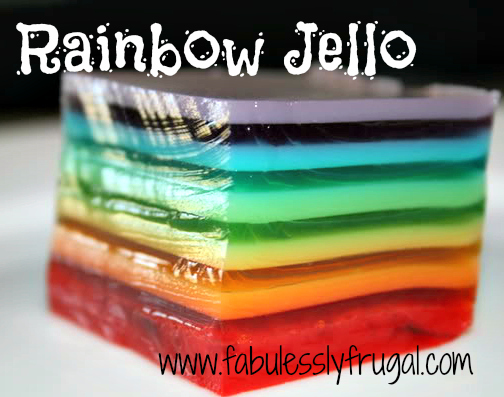 Although this rainbow jello recipe is super easy to make, it does take a bit of time. You’ll have to wait for each layer to solidify before you can add another so I recommend coming up with a plan of attack. For me, I like to do 3 colors per day (6 layers). I do one in the morning, one in the afternoon, and one at night. By working on the layers like this, it only takes me two days to finish my rainbow jello, and I only spend about 5 minutes on each layer. Note that between each color, the layers need about 3 hours to set. You’ll also need to let the jello sit for about 8 hours before serving. This is a bit of a tedious recipe to make, but it’s totally worth it. Once you take it out of that pan and see the beautiful creation you just made, you’ll understand what I mean. Also, this rainbow jello isn’t just a great dessert for kids, adults will love it too! You can eat it layer by layer if you’d like to taste each flavor individually, or you can eat it all at once for a flavor explosion. By the way, if I’m making this dish and I want it to be fancier looking, I use a bowl like this Gorham Crystal Flared Bowl instead of a glass baking dish… It gives it that something extra, and the presentation is beautiful!! Starting with either Red or Purple, work your way thought the different boxes of jell-o in the order (or reverse order) listed above. Dissolve 1 package Jell-O in 1 cup boiling water. After dissolved, split into 2 bowls. Add 2/3 cup cold water into the other bowl, and stir for 10-15 seconds. Pour yogurt mixture into 9x13 pan and let solidify in fridge for 45 minutes. Pour water mixture slowly over yogurt mixture, and let solidify in fridge for at least 45 minutes. So this recipe doesn't take over my entire day, I like to split it up. I do one color as soon as I wake up, one color before I cook dinner, and one color right before I go to bed. That way it only takes a few minutes per day. a VERY full 9×13 pan. I am confused. Do you let the half with no yogurt sit on the counter for 45 minutes while the same color mixed with yogurt sets? I guess the color without yogurt will not set while sitting out? I just made this for St Patricks day- with a little whipped cream cloud and a gold coin. I made them in individual juice glasses though so I wouldn’t mess them up when cutting them- also so that it would be all ready to go when we were ready for them. Also- I was short on time and so I popped my layers into the freezer for 15 minutes each time and thus cut the time down to almost a third. I would mix up the next layer while my previous layer was setting and it kept the whole thing moving along pretty quickly. Thank you so much for this recipe – my kids were thrilled! That’s a great idea! I’m glad your kids love it!